A large, recently converted House of Character boasting a grand façade and 150year period features having an entrance hall with staircase, lounge, formal dining room, kitchen/living/dining and a spare toilet. All rooms downstairs have doors or windows overlooking a 13ftX17ft central courtyard. At first floor level one finds a master bedroom with a large dressing room and en-suite, 2 double bedrooms, a study, main bathroom and a hall with windows overlooking the courtyard. 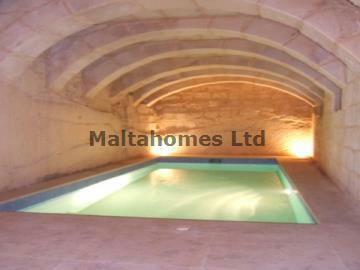 A striking aspect of this property is a large cellar with an 18ftx8ft pool/Jacuzzi.